This guide assumes that you have already installed QuantaStor and have successfully logged into QuantaStor Manager. If you have not yet installed QuantaStor on your server, please see the Installation Guide for more details. The default administrator user name for your storage system is simply 'admin'. This user account is present on all QuantaStor systems. At the login dialog the admin user account name is pre-populated as this is the most commonly used login. If QuantaStor was installed for you by a CSP or VAR the password for the system(s) should have been emailed to you or made available via the CSPs server management panel. If you've installed QuantaStor on a new server or VM the 'admin' account defaults to having a password of 'password' (without the single quotes). IMPORTANT: Please change this immediately after you first login via the Users & Groups section. The setup process is made easier with the Getting Started dialog which is accessible from the toolbar in the Web UI as shown in the image below. 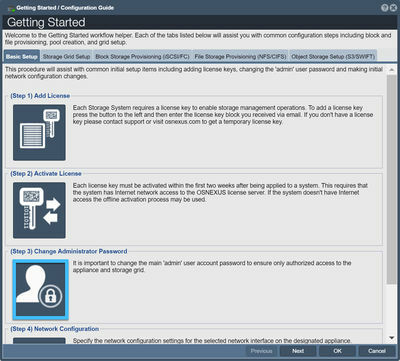 The Getting Started dialog has multiple sections which provide step-by-step assistance with the most common configuration tasks. Start by adding license keys (one for each QuantaStor server) if they've not already been applied to the systems. 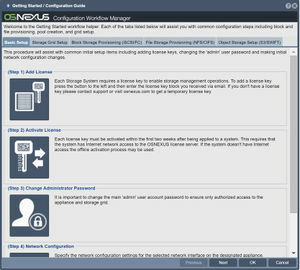 Many configuration steps cannot be done until a license key has been applied to each system. Combine systems together to form a storage grid. This enables a whole host of additional features including remote-replication, clustering and more. If your primary use case is to setup your QuantaStor as NAS filer, start here to learn how to provision Network Shares. If your primary use case is to setup your QuantaStor as a SAN, start here to learn how to provision Storage Volumes. If your primary use case is to setup an object storage cluster with 3x or more QuantaStor servers, start here. This page was last modified on 20 March 2019, at 20:55. This page has been accessed 60,687 times.